An Aedes aegypti mosquito feeds on the arm of an insect-control official in Key Largo, Fla., in this Oct. 4, 2012 photo. Mosquito control officials in the Florida Keys are awaiting approval from the federal government to begin releasing hundreds of thousands of genetically modified mosquitoes to stop the spread of dengue fever. The experiment will be the first of its kind in the United States. The goal is to eliminate the Aedes aegypti mosquito population in and around Key West. Dengue fever was thought to have disappeared from the area decades ago, but 93 cases were reported in the Keys during 2009 and 2010. Nicknamed "breakbone fever," dengue is a viral disease with severe flu-like symptoms. Though it is not fatal, victims are then vulnerable to dengue hemorrhagic fever, which can be. "We cannot speculate as to when a decision will be made," Shelly Burgess, a spokesperson for the Food and Drug Administration, told ABCNews.com. "But no genetically engineered animals of any species that FDA regulates will be released in the United States, including for the purposes of field trials, without appropriate regulatory oversight." If approved by the FDA, the British biotech company Oxitec would release non-biting male mosquitoes that have been genetically modified. The hope is that they would mate with the wild females already in the Keys, passing along a birth defect that kills their offspring before they can reach maturity. After a few generations, the population in the Keys would die off. The goal of the experiment is to reduce the risk of dengue fever without using pesticides, one of the only alternatives available. Earlier this year, Oxitec published an article in the scientific journal Nature Biotechnology, reporting the results of a 2010 field test in an urban setting on Grand Cayman Island in the Caribbean. Over a 23-week period, Oxitec released 3.3 million genetically engineered male mosquitoes on the island and claimed an 80 percent reduction of the dengue mosquito population. Insects and the diseases they carry are a growing issue in communities across the country. In Texas, the Dallas area had its worst year on record for West Nile virus. The mosquito problems faced by Texas and Florida differ, however. West Nile was spread by Culex mosquitoes, which are native to Texas. 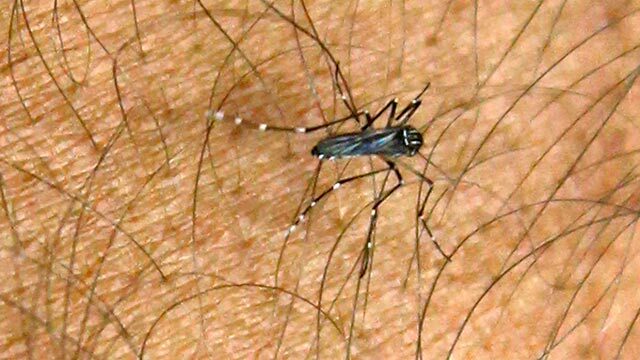 The Aedes aegypti mosquito, which spreads dengue fever, is not native to the Keys, and is not a significant food source for other animals. "The Dallas county area opted for aerial spraying of pesticides and never considered releasing genetically modified mosquitoes," Christine Mann of the Texas Department of State Health services told ABCNews.com. But with its fragile ecosystem, mosquito control officials in the Keys have been searching for alternatives to pesticide use, which can have a negative impact on public health and wildlife. "Because the mosquito we are after is a guerilla warfare type, hiding underneath homes and in bushes, large scale spraying is not effective," Michael Doyle, Executive Director of the Florida Keys Mosquito Control District, told ABCNews.com "In order to ensure the health and comfort of our residents and visitors, we think this is a scientifically reasonable approach to controlling this type of mosquito."